French Walker was writing and composing songs when local indie label Will Records convinced her to get in the studio. She formed Lucky Me and was the singer, songwriter and composer for the band. Lucky Me included members of Seattle bands such as Voodoo Gearshift, My Name, The Posies, and Katie’s Dimples; they were managed by Curtis Management. 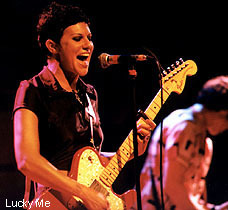 French recalls: “I am a female musician who endured the Music scene surrounded by men and what I can only refer to as the ghosts of grunge by being situated within the Kelly Curtis klan.” The band recorded and contributed a number of songs to soundtracks: “Scream”, “Homegrown” and “The Johns,” and released “Glue” on Will records. French is still recording as well as providing sacred voice to yogis and meditators. She’s posted music from the past and present at http://www.youtube.com/MsFrenchWalker, and released “Honeymoon Sea” in 2012.